In 2008 I wrote a book about a girl who gets to fulfill her dream in fashion – she gets her own catwalk show. This was Threads, which came out in 2009. By the time I’d finished it, I already knew what happened next to Crow, my fashion designer, and all her friends. I also knew what I really wanted to write about: slavery and exploitation in the fashion industry. 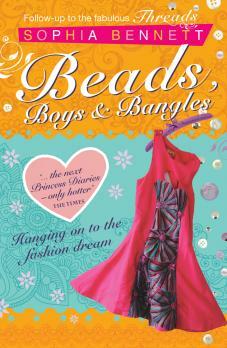 And so I wrote Beads Boys & Bangles. In it, Crow gets the chance to design a collection for a big high street chain. It will make her name, and her name, really, is all she has. Crow is a refugee from Uganda living in London, still young, still poor, still at school, still working things out. When she goes to India and discovers the true suffering behind some of the pieces in her collection, she’s prepared to give anything to make it stop. Anything. Even her name. I wrote the scene where Crow offers to give up her own name on her label six years ago, and I still remember finishing it, and the shiver of a thrill it gave me. It’s still my favourite scene in all the books I’ve written. And now, at last, a documentary maker called Andrew Morgan has made a film to explain why it’s so important to understand how clothes are made, and to care, and to do something about it. Because it’s not all good. A lot of it is bad. And we can make a difference if we want to. The film is called The True Cost, and comes out next week around the world. Lots of fashion bloggers I know are already excited about it and I hope it changes the way they talk and think about what they buy, and what they wear. Against a background of sadness, I discovered something wonderful when I was writing Beads Boys & Bangles: girls who love books can make a real difference. Because girls who love books also buy things. And if they understand what they are buying, they can change what they buy (to ethical and vintage clothes, for example), and change the minds of manufacturers (who won’t make cheap clothes in dangerous factories if nobody will buy them). Girls who love books can change the world. Girls, and boys, who watch documentaries can, too. Maybe the world of fashion is about to change. I’d like to think so. Tags: documentary, empowerment, fashion, reading. Bookmark the permalink.